The room was dark, yet familiar, and a heavy smell of loneliness soaked its marbled floor. In the corner, a young woman contemplated her adversary. Darkness – but where was light? Her mind was locked in a hazy maze of “where” and “why”. Curiosity left unfulfilled by too many answers. Identity, confused by too many suggestions. Life’s light sucked into the black hole of uncertainty in purpose. Where was light? No, not the artificial light of technology, or the momentary spark of a novel idea. Where was light that would last longer, shine brighter and lead more strongly? She wondered, she pondered, and she wearied herself searching through the same routes. Then, in a moment of anguish, she cried out and lifted up her head. Now, she saw her surroundings for the first time. Light, but as if from within her eyes. It illuminated the ground at her feet and where darkness had been, she now saw the gleam of white marble. It gave her strength to stand, and as she did, her light seemed to increase. With new confidence in her spirit, she took her first step in light. Every step was light and filled with discovery. A flash caught her eye – a mirror by the wall. She walked towards it, curious yet trembling with trepidation. Any blemish could be revealed by the mirror’s reflection, and any offense threatened to erase her steps of confidence. Yet, she dared to come nearer. As she approached, she felt the warmth of honesty, mixed with the cold air of vulnerability. The mirror’s surface grew brighter and clearer, until shadow became form, and shading took shape. There she stood, plain in dress, yet illuminated by the light she had just found. 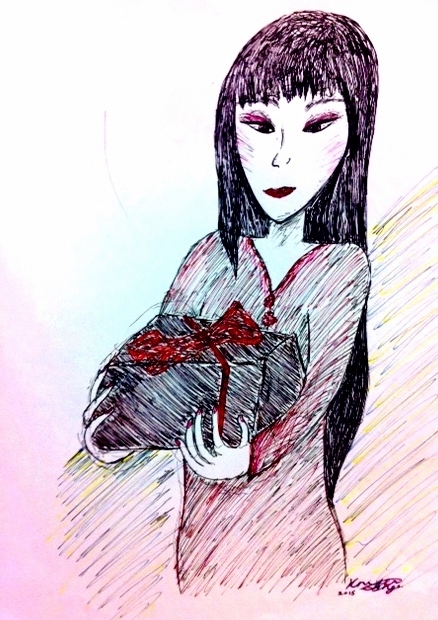 In the mirror, her reflection stood holding a black parcel tied with red ribbon. She reached out towards the reflected parcel and the image disappeared. There was something by her feet – the parcel. She felt the silken crimson ribbon, contrasted against the rough dark paper beneath it. She wound her fingers around the red bow and pulled. The bow was untied, the red ribbon fell to the ground, and the black paper turned to gold. In the distance, the young woman thought she heard an orchestra play a triumphant song. She smiled as the music made her heart rejoice. The gold wrapping was beautiful. She could see her reflection in its brightness, and she felt a sense of glory fill the room. Still, this was just the outside of her parcel and she wanted to see what lay inside. So gently and carefully, she peeled back the gold. The wrapping seemed to fill the air around her with light as she pulled it away from the cardboard box beneath. The woman was disappointed. There had been such excitement and wonder in the first layer of this parcel. Yet now, she looked upon an ordinary brown cardboard box. Eager for another experience of wonder, the young woman quickly tore the box open. The tattered cardboard fell, shriveled on the ground. Beneath the cardboard, thin tissue paper sheets raised their fragile salutes. In her haste to find a more beautiful layer again, she had torn some of the sheets. Yet, they waved with their colourful, pointed arms, somewhat unphased by her rough approach. She stopped to admire the grace in the tangle of their colours. Slowly, and gently now, she made her way through the layers of tissue. A feeling of security washed over her as she unfolded the many layers, and she felt the texture of assurance in the coloured tissue that passed through her hands. As the last of the tissue drifted away, the woman found herself holding a small casket of finely polished wood and silver. The silver design was intricate like lace, and its luminance was like a river of life. There was a lock on the casket, but the woman found no key. The casket would not open. So close to discovering what lay inside, the woman wept with desperation. She needed to know, but the strength of her own fingers seemed unable to prise the casket open. She looked around her and noticed the mess of cardboard and tissue at her feet. Angry and frustrated at her failed efforts, she swiped the mess away. As she did, she heard the sound of metal strike the marble floor. There, smoothly affixed to a crumpled fragment of the cardboard box, a tiny key sounded its existence. She would have missed it, if not for the momentary glint of its shining surface against the dullness of its cardboard harbour. The casket opened and there upon a pillow of blood-red satin, the woman found a pearl as white as snow. She saw her reflection in it, but more than a reflection of her face. It was like the memories of her life were contained within this pearl – every choice she made, every tear she lost, and every laugh that escaped her lips. She took the pearl, and fingered its silver chain. This was undoubtedly hers. The young woman placed the pearl around her neck, and covered it with her hand. She could feel her heartbeat behind it, and she knew she had to protect this precious pearl. As she stood there, she heard a whisper in the wind and she found her name – Adalia, God, my refuge. At that moment, the light from her eyes increased like a sudden sunrise. It cast away the shadows from before her and unveiled a magnificent scene. She stood in a marble courtyard with pillars stretching to the heavens, and the most beautiful landscapes on every side – a waterfall to the right, forests at her left, mountains before her, and a vast desert plain behind. She marveled at the place she was in and as she did, she felt an exuberant joy pulse through her body. She had no more fear, and with confidence, she let her curiosity lead her. The light was now everywhere and there was no more darkness – just the promise of unending wonder.